1.Please be sure it is installed in a well-lit location where the solar panel can get maximum sunlight during the day, and keep it Full Charged the device with 6-8H at first time use. If there is no good sunlight or in winter sunlight, especial in North countries, it may take longer time to fully change the device, and this is very normal for solar products. 2.Please confirm the switch is under ""on"" status so that the light could be charged normally and auto lights on at night. 3.The spotlight won't light up in bright place. To turn on the light in the daytime, please fully cover the solar panel and make sure there is no light source or sunshine detected. " Waterproof, telescope design, install easily, Solar powered no extra battery or electricity wire needed. Use Amorphous silicon solar panels, get fully charged within 6-8 hours in sunshine. 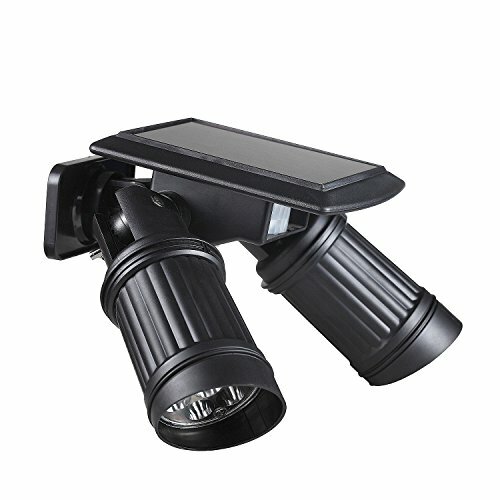 Dual head, 14 ultra bright LEDs illuminate the area below the light. Lamps can swivel 180 degrees so they can be positioned however you need them. Build-in PIR sensing device, turn on for 15 seconds automatically in dark when motion is detected, which saves energy. Detection rang between 5-7 meters at a 120 degree angle, and the mounted height should be 1.8 to 2.5 meters (6-8 feet) for maximum detection range. IP44 Waterproof design for durability.Ideal for driverways, carports, garages and entrance door.